1 of 2 Heat oil in a large, lidded nonstick saute pan on medium-high heat. Season chicken on both sides with 1/4 teaspoon of the salt and the pepper. Add chicken to pan; cook 3 minutes. Flip and cook another 3 minutes. Remove from pan and set aside. 2 of 2 In same pan, reduce heat to medium and add fennel. Saute 3 to 5 minutes or until slightly softened. Add garlic; cook 1 minute. Pour in wine, bring to a boil and cook 1 minute. 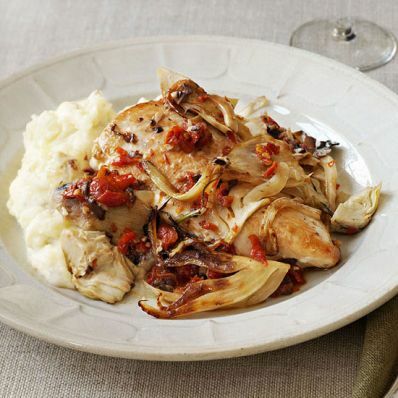 Stir in artichokes, olives, sun-dried tomatoes, chicken and remaining 1/4 teaspoon salt. Cover and cook 3 minutes or until heated through. Serve with mashed potatoes, if desired.